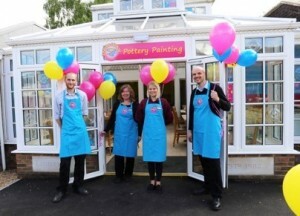 Squire’s Garden Centre in Badshot Lea near Farnham has opened an exciting new pottery painting studio called Mambo Jambos. Children and adults of all ages can have fun and relax while painting their own unique pottery pieces in colourful and vibrant surroundings. Mambo Jambos staff will be on hand to offer creative ideas and tips, and you can also enjoy a drink and snack while you are there. Customers can choose from a wide selection of pottery to paint including mugs, plates, moneyboxes and animals. Each pottery piece is individually priced and starts from just £4, plus there’s a studio fee of £2.50 per person. Once painted, your unique design will be glazed and fired, ready for you to collect within a few weeks. You can book children’s birthday parties at Mambo Jambos, and they also have a Toddler Group every Monday 10.30am-12pm in term time for 2-5 year olds for just £3.50 per child (booking is essential). You can even get an imprint in clay of your child’s hands or feet, to remember just how small they once were! Mambo Jambos is opposite the exit to Squire’s Garden Centre. It’s open 7 days a week, Mon-Sat 9am-6pm and Sundays 10.30am-4.30pm, and there’s plenty of free parking. To book call 01252 317276 or email MJ.BadshotLea@squiresgardencentres.co.uk. Mambo Jambos, Squire’s Garden Centre, Badshot Lea Road, Farnham, GU9 9JX.